It has been a whirlwind since getting back home from Texas on Monday, and back to work on Tuesday. I finally have a minute to post. The Round up was fun, productive and the food was outstanding! 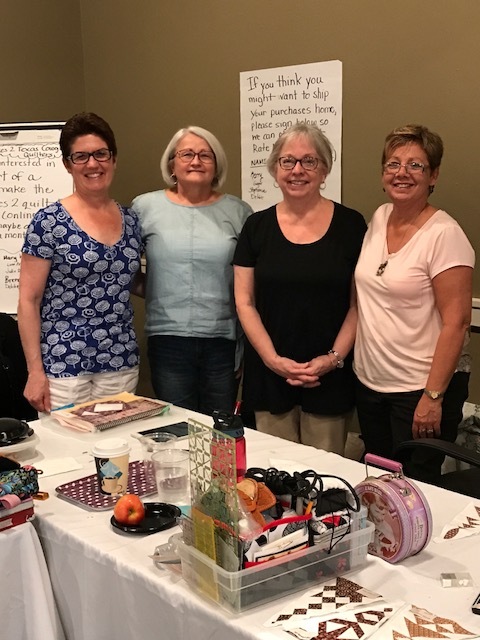 It was great to see Janiacs from our previous Round up, and to meet new ones. Everyone was working on their version of Dear Jane, with a few working on other Brenda projects. 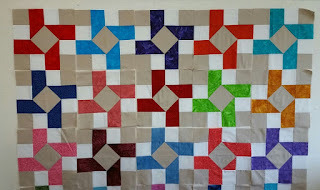 Below are the blocks that I finished, with some needing just a bit of hand sewing for the applique. My Tablemates and I, all decided that we would finish our Dear Jane's this year, share at the next Round up, and start on Dear Hannah next year at Round up. 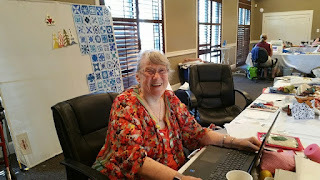 Pat volunteered to email us every month to remind us to get Jane done! 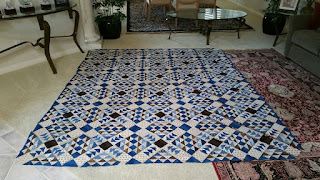 For me that means finishing up 15 more Triangles and 58 more blocks. I will need to spend some time each month to get them done. So watch fro my Dear Jane posts and see if I am making progress. 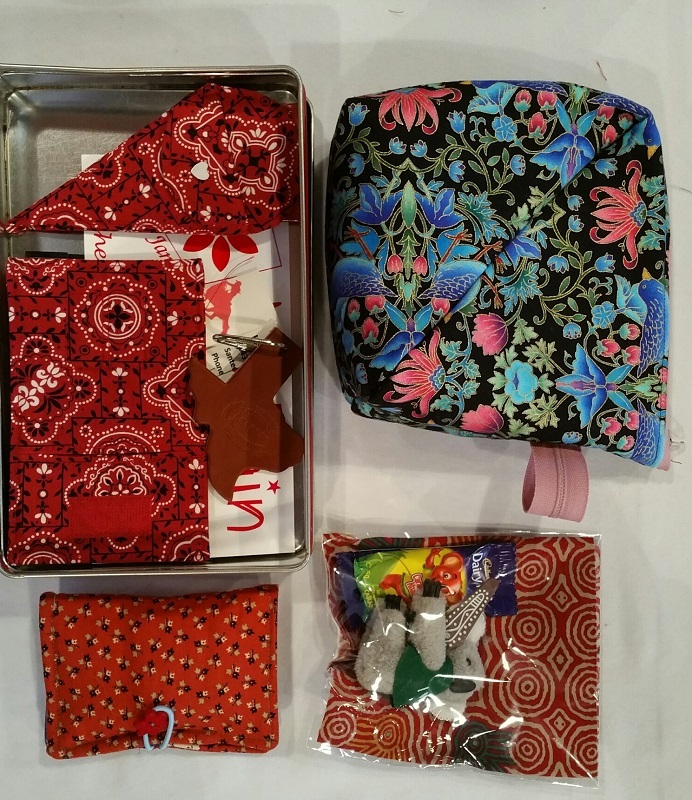 Brenda also shared her stash with us- which is pretty extensive. She brought many bolts of fabric, books, pattens and kits for us to purchase at very discounted prices. Check back for my stash report on Sunday to see the damage! Yes, it is that time of year again. I am in Texas for the 3rd Annual Dear Jane Round up, hosted by Brenda Papadakis. 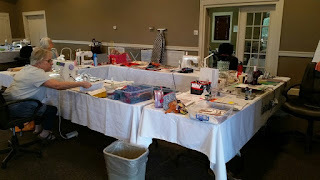 Once again we are at Newt's Tennis Ranch for a great time of sewing, food and a little shopping. 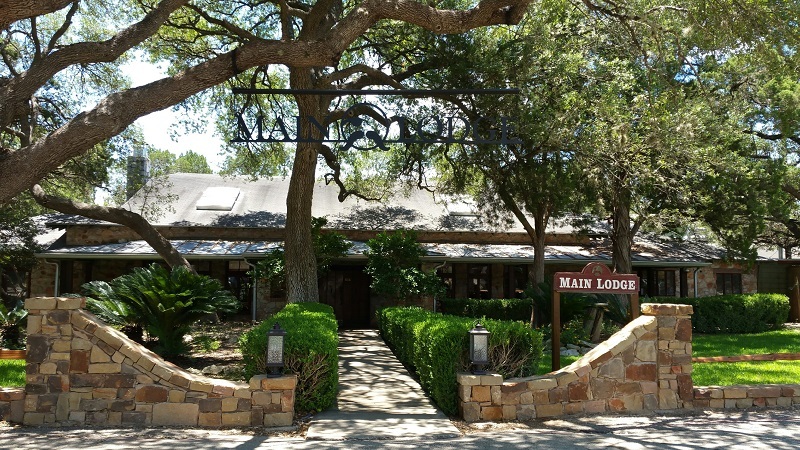 There are 22 of us this year, many from past retreats and some newbies. 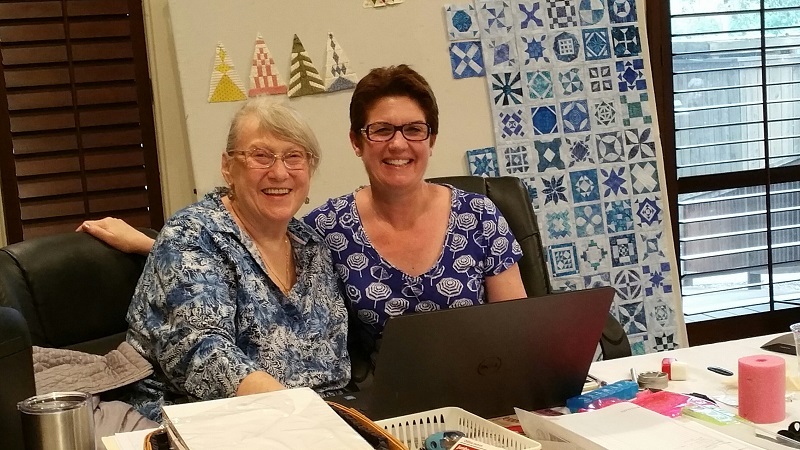 Maureen came all the way from Melborne, Australia, and Joanne came all the way from Whitehorse, Yukon. 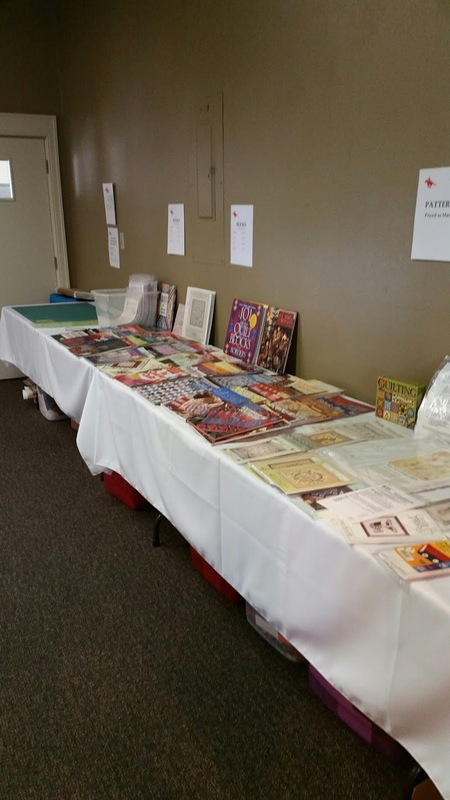 We have a nice bright room, with lots of table space to spread out. I am at the back table, Joanne is at the right table. Lisa and Pat, pictured, are from Texas. We all sat together last year. Below are my blocks for the first two days. Check back later to see progress. All the ladies are very creative and bring lots of fun goodies for everyone. 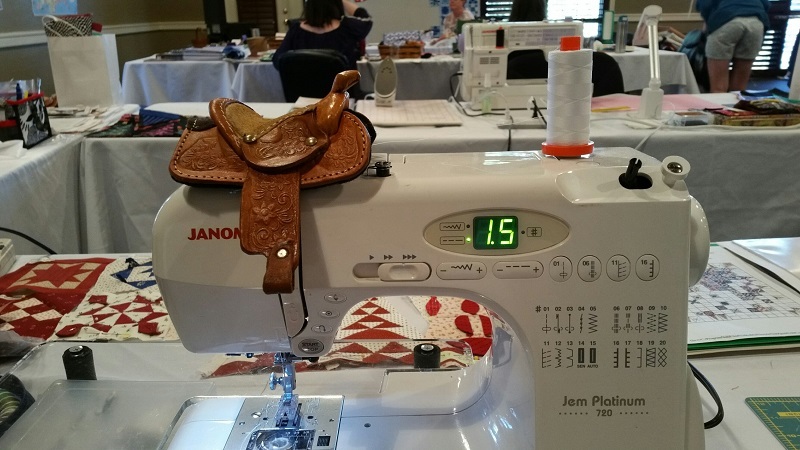 One of my favorites is the saddle from Brenda! Today is day three, and we are off to the Quilthaus after lunch, for a trunk show from Westminster Fabrics, and a little shopping. 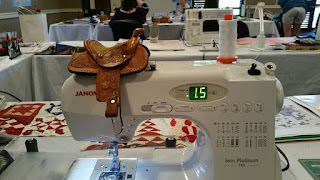 I am off to get a few more blocks complete before lunch! 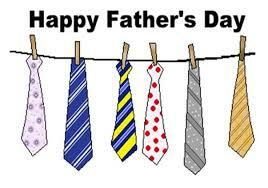 Hope you are enjoying your Father's Day with that special Dad in your life. Lot's to report this week with two finishes. 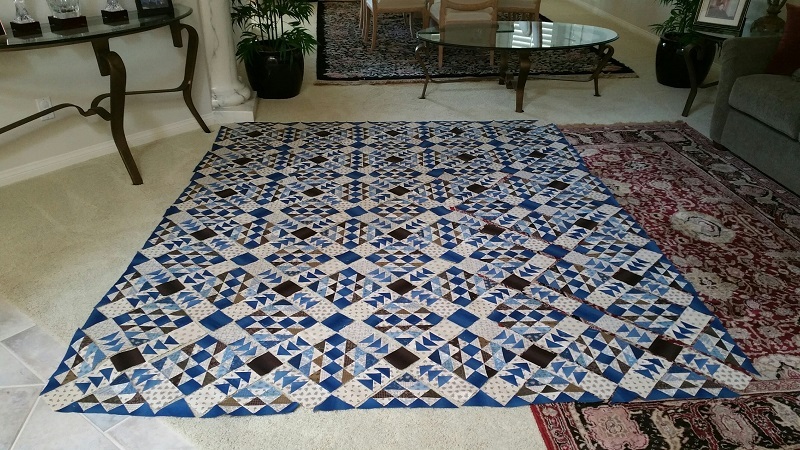 Union Blues is complete! 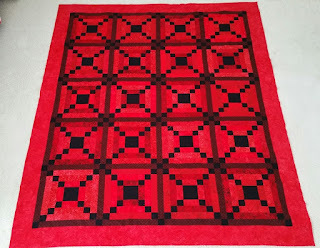 This quilt finished at 85x102. Yes, it was too big to even take a good picture of. This is one of my UFO's for the year, so I am really glad this one is finished! 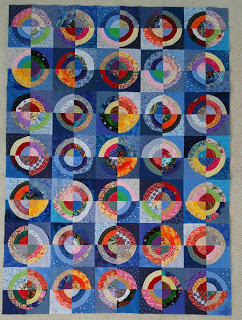 Also completed this week was my June UFO, Rotation. 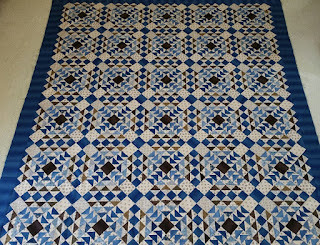 More on this quilt in a future post. 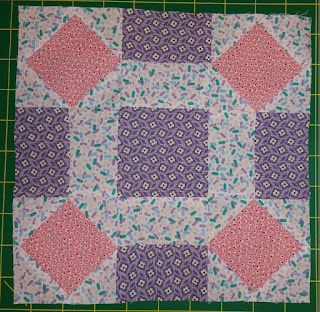 With this one I can only take credit for backing/binding usage, as the blocks were all won from Sunshine Quilt Guild and not from my stash. Purchase this week included the fabrics below, from our June auction at Sunshine Quilt Guild. 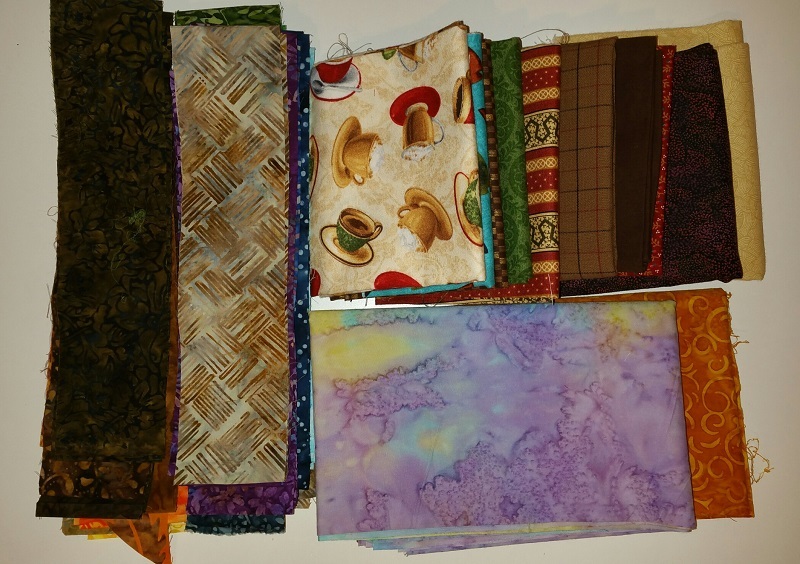 Just an assortment of fabrics to add to my stash and support the guild! Used this week: 31 yards. Purchased this week: 10 yards. Net Fabric Used YTD: 81 yards. Getting closer to 100 yards used this year! Hope you are also having some success. This week has flown by, already Thursday and I am just getting around to posting my Design Wall. So the rest of this week I am working on Rotation. 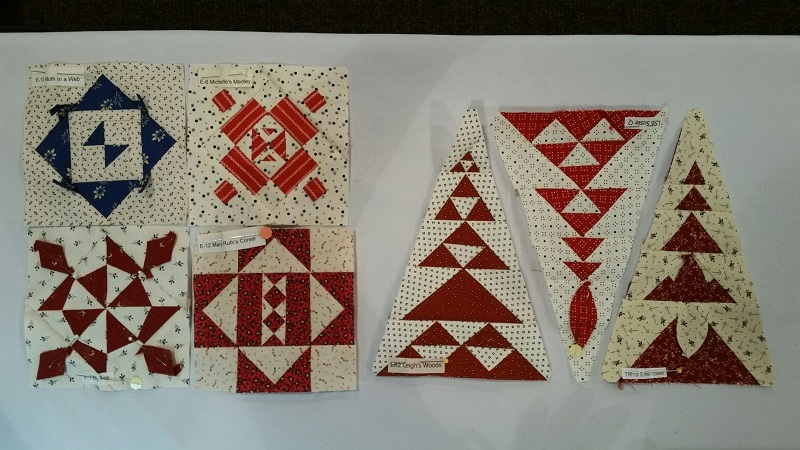 These were blocks that were won from Sunshine Quilt Guild's Block of the month awhile back. 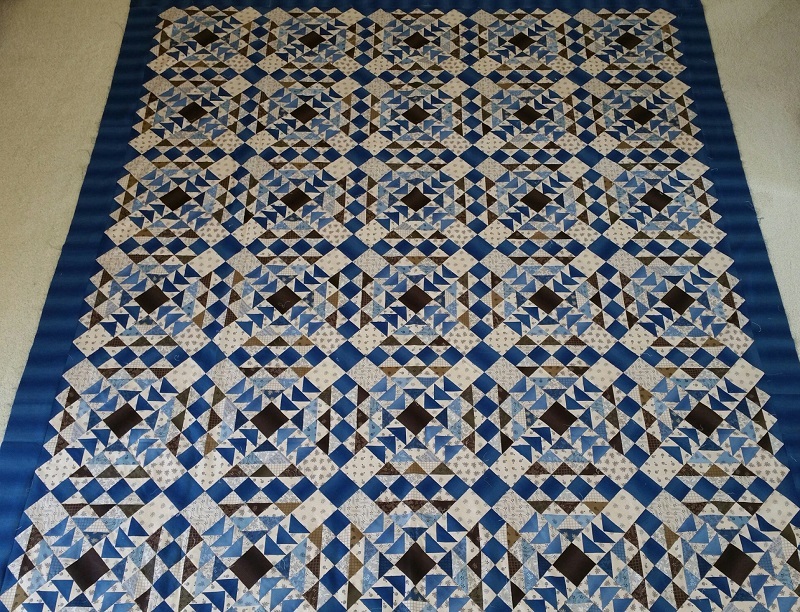 I had to fix a couple of blocks that were oriented wrong, and make 7 more blocks to finish up the quilt. Now it is just sewing together and putting a border on. Once this is done, my June UFO will be complete! 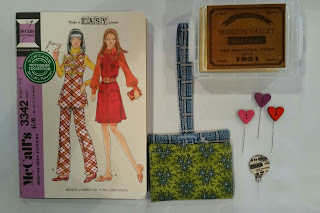 I have a big finish this week that I will be posting on Sunday, so check back for my updated Stash Report. Nothing new in the stash report this week. No adds and no finishes. 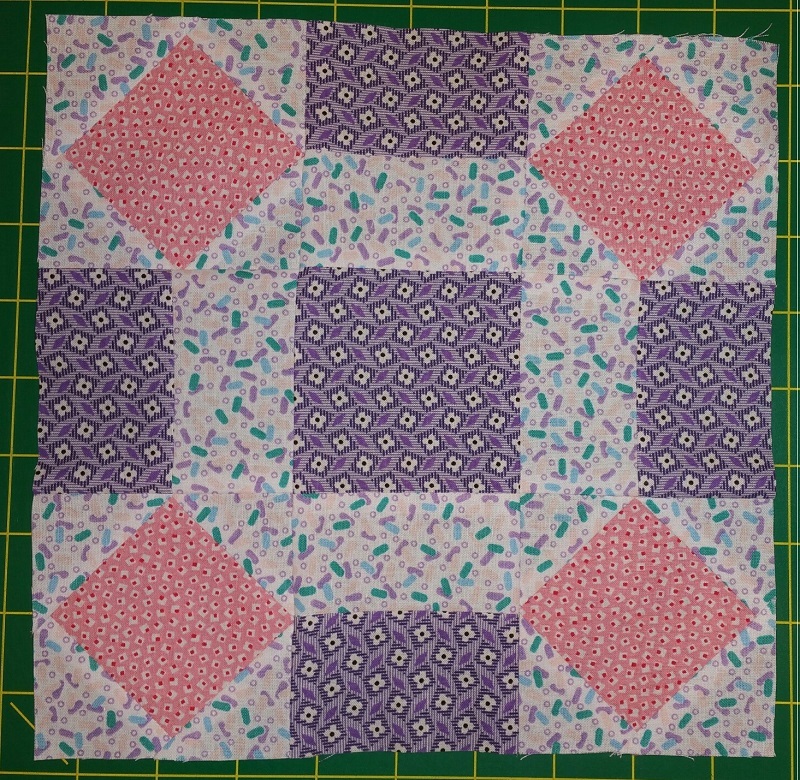 I did make a block for Sunshine Quilt Guild Block of the Month. This month was a 30"s theme. I have a couple of finishes on the horizon, so check back to see finishes later this week. Net Fabric Used YTD: 61 yards. As I mentioned in my previous post, I will be busy at work this week trying to get Union Blues off the living room floor. It is way to big for my design wall at 86x101, so on the floor it sits. 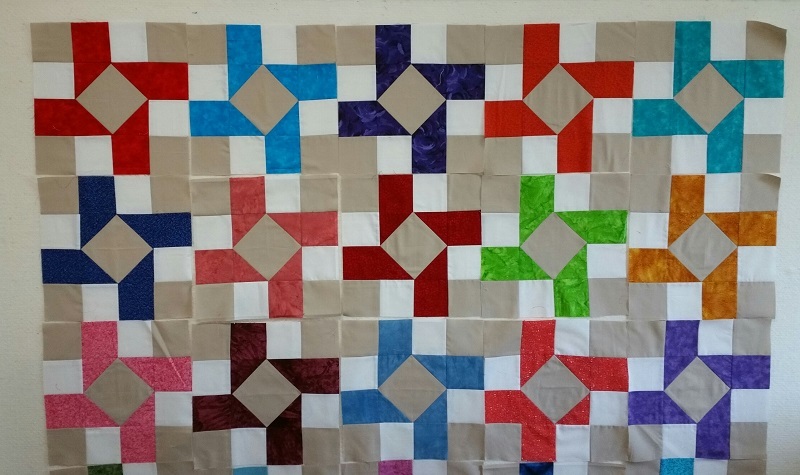 It is sewn together diagonally into rows and then the rows sewn together. Lastly will be the borders. I am sure this one will take me awhile, there are a lot of pieces to go together! It was also hard to photograph on the floor, but hopefully you get the idea! Check back later this week to see if I have made any progress. This week a finish! And no adds, at least for now. 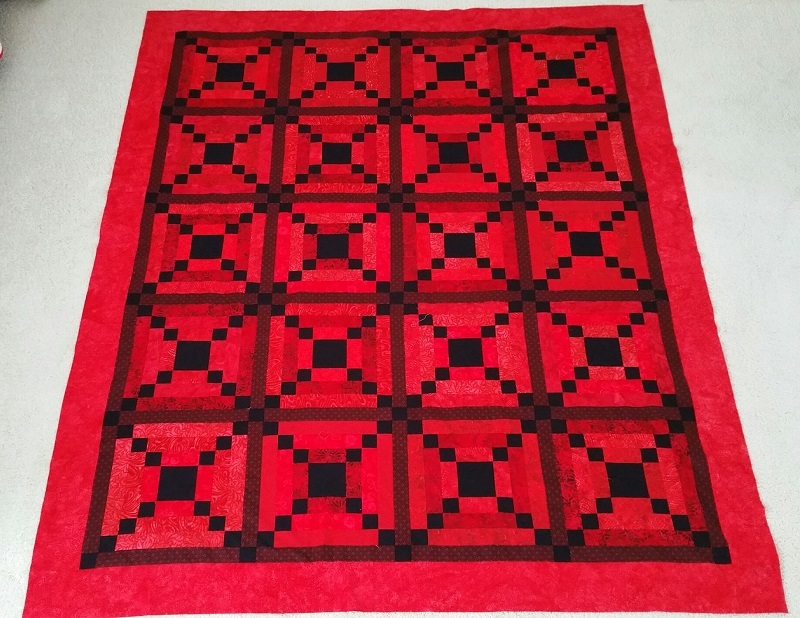 Below is Red Vines, finished and ready for the quilting que. I even have the binding cut out, and have cut all the 10.5 inch squares for the backing out of all my leftover reds and blacks. Will find some time this week to sew the back together. Nice to have a finish and use up some of that stash! Next up will be putting together Union Blues and then my UFO for June. A lot to keep me busy this month! Used this week: 12 yards. My UFO finish for May is Bulls Eye. I actually finished this one in March. 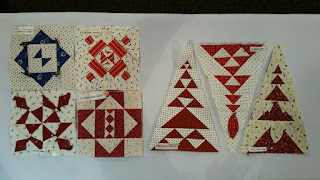 I won the blocks from Sunshine Quilt Guilds monthly block drawing a couple of years ago. 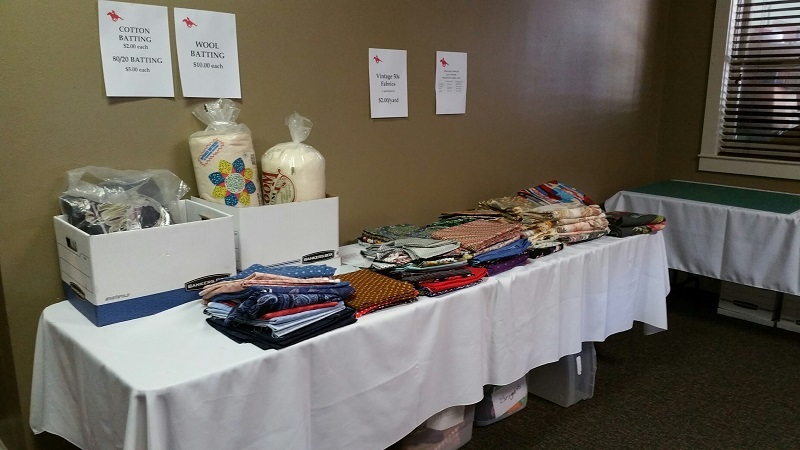 Each month you purchase a "kit" for a specific block, turn it in at the next meeting and you are entered to win all the blocks. When I first won these blocks, I was not particularly fond of them. But after cutting them up in quarters, mix up the quarters and re-sewing them together, I really like it. It is now in the quilting que, with many of my other quilts, waiting to be quilted in between my clients. 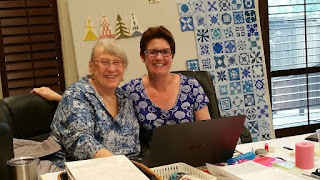 Seems there is never enough time to quilt my own quilts! 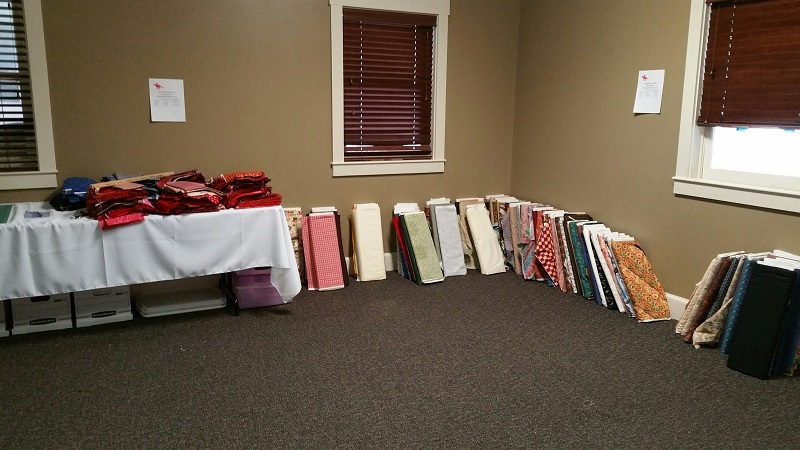 See more great finishes at Patchwork Times.